Anna Bolton | Greene County News Judge Stephen Wolaver looks up at the clock as he speaks with Defense Attorney Peter Certo and Assistant Prosecutors Cheri Stout and David Morrison during the aggravated vehicular homicide jury trial Jan. 29. XENIA — A woman who lives on Hussey Road didn’t see the Aug. 27, 2016 car accident outside her home that claimed a life; she heard it. Cunningham was the second witness in the second day of the jury trial for Kathy Smith, driver of the red car. Raymond Deyo, 68, driver of the truck, didn’t survive the crash. Smith, 65 of Xenia, is on trial now for two counts of aggravated vehicular homicide, second-degree and third-degree felonies, one count with mandatory imprisonment; two counts of aggravated vehicular assault, third-degree and fourth-degree felonies; and operating a vehicle under the influence of alcohol and/or other drugs, a first-degree misdemeanor. Cunningham called the country road in Caesar Creek Township “extremely busy and extremely dangerous,” with steep ditches on both sides. At sight of the accident, she said she asked her daughter to call 9-1-1 before running outside to give aide to the victims. The witness then testified to Smith’s demeanor. “She appeared to be intoxicated to me. She looked like — the look on her face said to me that she was under the influence of something … she had the demeanor of somebody who has had that much — their facial expressions change,” Cunningham said, adding, when Assistant Prosecutor David Morrison asked, that her speech was slurred. A man named Bruce Taylor showed up at the scene, Cunningham continued, “swaying” as he spoke to an officer. Taylor’s alleged next-door neighbor had taken the stand moments earlier, testifying that he had seen the man and Smith together splitting wood right before the accident, just a few miles away from the scene. As Defense Attorney Peter Certo cross-examined Cunningham, she agreed that she had written nothing in her witness statement about intoxication or slurred speech. Xenia Fire Division paramedics who responded to the scene noted Smith was alert, oriented, and answering questions appropriately. Joshua Rothenberger, paramedic, said he tested Smith on the Glasgow Coma Scale, which is used to assess head injury, on which she scored the highest number — 15 — four different times. A comatose patient would score 8 or less, the scale indicates. Rothenberger noted that she was in a bit of a stupor, and seemed a little drowsy. He also said she admitted to using alcohol. “We’re trained to assess mental capacity. We’re not trained to assess intoxication,” Rothenberger said, as Certo questioned him. He said he had made no notation of odor of alcohol, slurred speech, disorientation or bloodshot eyes. When Smith arrived at Miami Valley Hospital (MVH), according to the attorneys, her blood was drawn for an alcohol test. Backed by testimony from a nurse and lab technicians, the results came back as .343 — four times the legal limit of .08 for driving in Ohio. Dr. Daniel Hood, medical director of CompuNet Clinical Laboratories at MVH, said the test was conducted on automated instrumentation, with very little human contact involved. He said the test was run once, and that the lab was not asked to re-order the test. While Hood testified that the machine on which the test was done is inspected every two years, CompuNet lab scientist Justin Haney and lab technician Dustin Haworth testified to “quality control” done on both the ethanol test and the machines the day of the accident. The prosecution’s final witness will take the stand when trial resumes 9 a.m. Wednesday, Jan. 30 in Judge Stephen Wolaver’s courtroom. 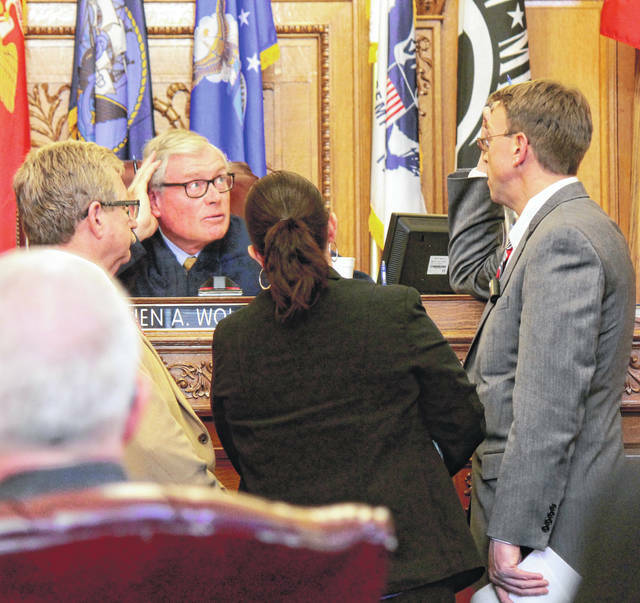 https://www.fairborndailyherald.com/wp-content/uploads/sites/50/2019/01/web1_WolaverClock2.jpgAnna Bolton | Greene County News Judge Stephen Wolaver looks up at the clock as he speaks with Defense Attorney Peter Certo and Assistant Prosecutors Cheri Stout and David Morrison during the aggravated vehicular homicide jury trial Jan. 29.